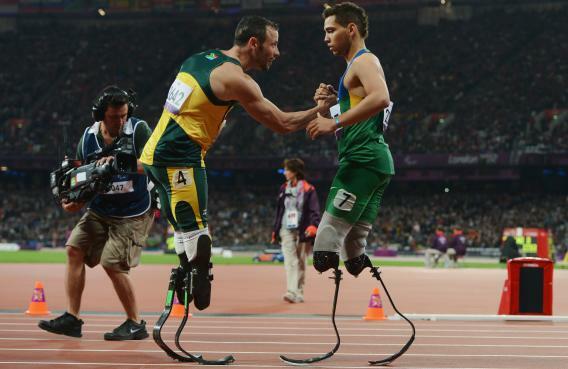 Oscar Pistorius, Alan Oliveira: The South African Paralympian accuses his rival of getting an illegal leg up. Alan Oliveira of Brazil (right) is congratulated by Oscar Pistorius of South Africa after winning gold in the men’s 200 meters at the Paralympics. Photo by Gareth Copley/Getty Images. The Paralympics began as expected for Oscar Pistorius, with the bilateral amputee setting a world record in the first round of the 200 meters, crossing the line in 21.30 seconds. Pistorius’ expected coronation in Sundays final did not go as planned. After taking a huge lead in the backstretch, the South African was overtaken by Brazil’s Alan Oliveira. Pistorius takes issue with both the leg-height formula and its implementation. “The [International Paralympic Committee] have their regulations. The regulations [allow] that athletes can make themselves unbelievably high,” Pistorius said after losing on Sunday. “If you look at videos from last year, Alan was shorter than me but now he’s taller than me,” he explained, arguing that Oliveira and bronze medalist Blake Leeper of the United States (who he also called out as a leg lengthener) should be forced to pick a height and stick with it. After the race, the IPC released a statement defending its procedures, saying that “all athletes were measured today prior to competition by a classifier and all were approved for competition.” Pistorius, though, claimed that “the guys rarely do the measuring in the call room.” The insinuation: Oliveira might have swapped in longer legs when the judges weren’t looking. Regardless of whether there was any skullduggery, it seems that Pistorius is wrong about Oliveira out-heighting him. According to the Guardian, “Pistorius races at a height of 184 centimeters because he continues to use blades that are sanctioned for non-disabled competition, despite the fact that he could wear prosthetics that extended his height to 193 centimeters under the IPC rules.” That makes the South African roughly an inch taller than his Brazilian rival when they’re both wearing racing legs. Oliveira’s lengthier faux limbs, though, have helped him close the height gap. On the medal stand, when both athletes are wearing non-racing prosthetics, Pistorius appears to be half a head taller than Oliveira. There’s an obvious irony in Pistorius complaining about someone else’s carbon-fiber legs. In 2008, the sprinter was briefly prohibited from running against able-bodied athletes when the IAAF decreed (based on one poorly designed study) that his artificial limbs gave him an unfair advantage. But just like the governing body that once banned him, it seems Pistorius is wrong on the science. In a blog post on the website The Science of Sport, Ross Tucker explains that it’s Pistorius, not Oliveira, who had the stride length advantage. The reason the Brazilian won, finishing in 21.45 seconds compared to 21.52 for Pistorius, is that he had a faster stride rate—that he simply propelled his legs faster than the South African did. Amid all the controversy, one thing is clear: If Pistorius had run as fast in the final as he did when he set the world record in the first round, he would’ve won the gold medal.